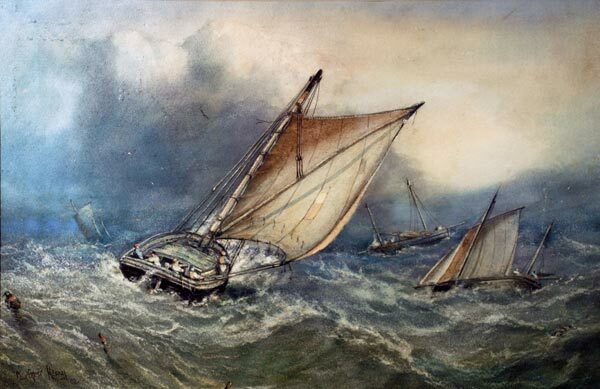 Summary: Watercolour painting by C N Hemy showing a number of boats out at sea during a storm. Description: The son of a composer, Hemy worked briefly as a gold miner in Australia before becoming a monk and serving for three years in monasteries in Newcastle and Lyons. He left before taking his final vows and became a painter, his subjects including landscape, seascape and historical painting. 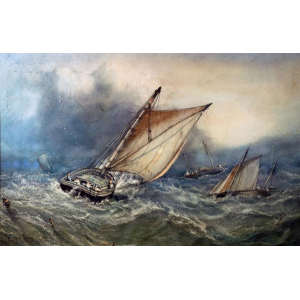 He moved to Falmouth in 1882 and marine painting dominated the rest of his career. His marine and coastal scenes illustrate his knowledge and love of the sea .